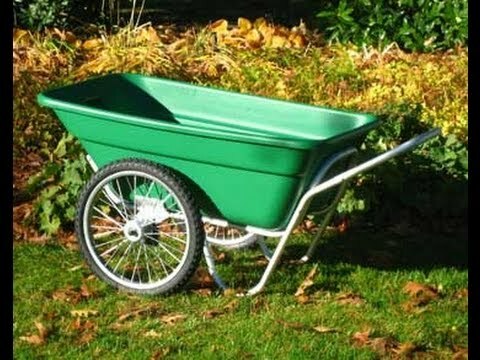 Gardening cart that is easy to maneuver and balance. Dimensions (in packaging): 43" x 25" x 13"
I was struggling with using the traditional one-wheeled wheel barrow, and I have lower back problems, so I was thrilled when I saw this on Grommet. It's so easy to use and even easier to push up an embankment. Thank you for selling such a great, useful product! I know these carts are fabulous because I have two of them. Think your company is great. 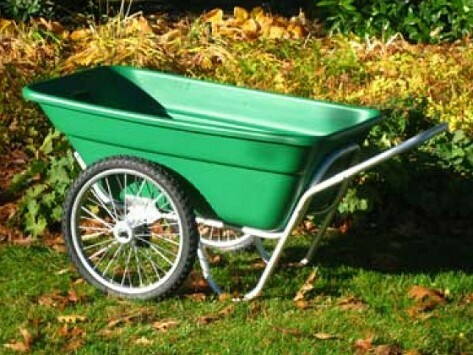 Wheelbarrows had been in use for many hundreds of years before Henry Muller, a retired Brigadier General in the U.S. military, decided it was time for a modern makeover. He envisioned a more stable cart that’s strong enough to carry heavy loads, yet agile enough to navigate tight quarters and rough terrain. He patented his rugged invention, called the Smart Cart. He is pictured here demonstrating its versatility. A Smart Cart has two wheels, situated near the middle of the tub to distribute the load more evenly. This gives the cart greater stability, so you don’t have to worry about arm-wrenching struggles to balance a one-wheel wheelbarrow. You also can push or pull the Smart Cart from either end, unlike a wheelbarrow that requires you to stand behind the two handles. The sturdy frame is made of rustproof aluminum, and the seamless, waterproof plastic tub snaps into place. The company builds its carts in Gorham, Maine, and folks hear about them largely by word of mouth (you won’t find Muller’s Smart Carts for sale at big-box retailers). We heard about the Smart Cart from a Grommet friend, Carol Chandor, who uses hers to haul groceries, recyclables, and other home supplies. It’s ideal for gardening, small farms, riding stables, marinas and even a trip to the beach. And when it’s time for relaxing, it makes a fun serving cart. Just hose it off, load it up with ice and your favorite beverages (the tub is leak-proof, since it has no bolt holes), and invite the neighbors.